Have you ever tasted fresh carrot juice? I’m not talking about the pasteurized, two-week old bottled Odwalla you can buy at the grocery store for $7…I’m talking about carrot juice that’s still warm from the carrots that were just sitting out on your countertop, and so fresh that the juice is nothing but frothy sweet goodness. You know, that kind of fresh. Well, this is the first reason why I just spent so much money on a juicer. I lovelovelove fresh vegetable juice, but I’m not paying for it at the grocery store. Why not? I’m vegetarian, but I still feel that often I don’t eat enough fresh vegetables. Having an at-home juicer means I can quickly whip up a glass of carrot and tomato juice and, within minutes, add a significant punch of vegetables to my daily intake. How many vegetables does it take to get a glass of juice? I’m a fan. Thanks for writing. I usually will use 4-5 carrots and 4-5 celery sticks, and that makes enough juice for two big glasses for me and my husband. The veggie remenants is pure fiber…it’s very very dry. I’ve been eating a bit of it (since fiber is so good for you!) and it actually tastes better if you wet it back down a bit…like carrot slush! Everything I don’t eat goes into my worm bin…and it’s practically gone the next day. The worms LOVE the pulp b/c it’s so finely ground! The pulp collects on a large pitcher on the side of the juicer. It’s very easy to get out! You’ll have several large handfuls of pulp when you use the amount of veggies I described. Juicing can be addictive! My daughter makes a “tropical” juice drink from pineapple, strawberries, blueberries and oranges that is to die for! No sugar, nothing but the juices. I like juicing, especially, apples, carrots, celery, and beets. Then I might add a little extra of what I have in the fridge, swiss chard, parsley, cilantro, green onions, garlic, horseradish, and, lately, mustard greens. Whatever I am in the mood for. I juice with a Champion Juicer and juice the apples and carrots first (The carrots come out in such a bright lovely orange color.) I save this pulp and make a salad adding raisins with a dressing or I’ll make carrot bread. The pulp of celery, etc. is too stringing to use. Everything that’s left is put into compost. In my Chicago area there is an infomercial for a veggie powder drink,. The woman giving the presentation would always say how messy and time consuming it is to make fresh juice. I would just like to tell her and everyone else that it is well worth it to make fresh juice. The taste is super and the clean up is quick and easy because you are using raw fresh produce. I do use a powder veggie drink too, but can’t wait to once again taste fresh juice. My husband makes juice in the blender to keep all the pulp, which is quite tasty too. I was in Atlanta recently and ate at R-Thomas Restaurant. I ordered the veggie soup with apples and here it was so much like my hubby’s blender drink. I was amazed! I got a Omega vrt 330 for Christmas and I love it. I asked for it for pretty much exactly the same reasons as you decided to buy yours. I juice lots of stuff, usually with an apple or 2 to make it taste a bit better. A friend who has the same juicer said you can run the pulp back through a second time for more juice and then about 6 or 8 oz of water just to clear it out a bit. All in all..I love it! Enjoy yours and try throwing in a small handful of kale – looks gross- tastes good – apples rule in juicing for sweetness. We have had the exact same juicer for a couple of years and we still use it almost every day. This makes a great drink for two adults (we usually do it after our two young children are in bed — a little late night ritual for the two of us). Normally the dark green stuff at the end would be too much for me, but my wife and I have found that the apple and lemon make it quite delicious. A juicer is on my list of “gosh, i’d like to have that one day” stuff. Currently my budget, and my kitchen don’t have room for one, but one day they both will, and I will happily be sipping my carrot juice. Consider growing green shoots (sunflower greens or other microgreens such as argulua) at home. They grow well on cafeteria trays near a window and you cannot get fresher greens all year round! We have the same juicer and love it. We make grapefruit juice with an apple and a few grapes for sweetness, and always add a few carrots to the orange juice we make for the kids. I love to make my own juice from just quality oranges and nothing else. it´s the greatest thing in the morning to sit down with the paper, some coffe, bread and home made orange juice. 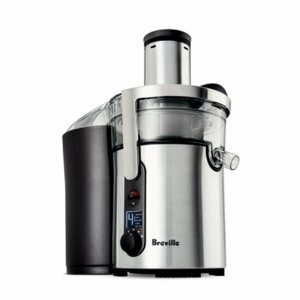 I have another Breville juice machine, a simpler one. But it works well, the brand is OK.
we purchased a juicer back in November, it sits nicely on the counter next to the panini press and the KitchenAid mixer… we got into home artisan bread making two years ago and haven’t purchased store bought since. Just discovered your blog and very much enjoying it! Gotta love finding fellow Michiganders on the interweb. I also have a Breville! And use it religiously. I add some liquid stevia as well because I have a sweet tooth. But if stevia’s not your jam, I’m sure an apple would also work. Very nice tips. Personally I just love having fresh vegetables and fruit juices and take full initiative to have it at least twice a day. I often use mixer for diluting them as it’s less time consuming and makes the juice all ready really fast. If you go for having juices in a restaurant, it will be highly expensive and sometimes your pocket won’t even permit. So it’s best to go for home made juices…..something that will be fresh and highly acquirable.